The first day of films at the biggest theatre at the Sundance Film Festival is always comprised of movies from the U.S. Dramatic Competition program (and day one’s were covered here) and then usually a pair of films from the “Premieres” section – movies that can get recognizable faces on the red carpet in the cold mountain air. Such faces this year include Emma Thompson, Mindy Kaling, Hilary Swank, and Rose Byrne—all wonderful actresses with great range. I just wish I could recommend their latest movies. The first one to premiere and the better of the two was Nisha Ganatra’s “Late Night,” written by and co-starring Kaling. The star of “The Mindy Project” plays Molly, a worker at a chemical plant who decides she wants to be a comedy writer one day and ends up in the all-male writers’ room of one of the longest-running late night talk shows, hosted by the legendary Katherine Newbury, played with icy aplomb by Emma Thompson. Pretty much everyone agrees that Newbury’s show “Tonight” has been coasting for the last decade or so, and there’s a new network executive (Amy Ryan) eager to replace Katherine, maybe even with a hot young stand-up (Ike Barinholtz, very much doing a Dane Cook riff). Can Molly make it in the alpha male world of comedy writing and save Katherine’s job at the same time? Clearly, this is a setting and concept that’s fertile for commentary on ageism and sexism in the world of entertainment, and any hyper-masculine workplace. And yet “Late Night” too often pulls its punches. It pours the concrete for the foundation of a better movie than what is ultimately built. Almost everything here is likable in a “The Devil Wears Prada” kind of way—the film has a great extended supporting cast that also includes John Lithgow and Hugh Dancy, and it’s great to see Thompson get such a meaty part and bite right into it—but I wanted something that sinks its teeth into the issues flowing through this narrative instead of just using them as backdrop or plot devices. “Late Night” is reasonably enjoyable, the kind of comedy that will play fine on Amazon Prime on a rainy weekend, but there’s so much material here, and such a talented cast, that I kept wanting more from it than it seemed willing to give. With morons out there who still think that women can’t be funny and given how this movie directly incorporates modern issues and movements like “Me Too,” I felt the sting every time a joke didn’t land (which is way too often) or a plot twist felt forced. It’s the case of a movie that’s reasonably “not that bad” but that I really wanted to be great. Sundance 2019 took a sharp turn on Friday night, pivoting from likable comedy to dark sci-fi in Grant Sputore’s stylishly bleak “I Am Mother,” a film that feels influenced by sci-fi legends like Stanley Kubrick and James Cameron, and a modern one in Alex Garland. The film opens in an underground bunker on the day the world ends. A robot named Mother, voiced by Byrne, comes to life on that day, programmed to oversee hundreds of embryos that will repopulate the human race. She creates life in the human known only as Daughter (Clara Rugaard), and then the movie flashes forward to a point in which Daughter is a teenager, eager to see what’s outside the bunker. Mother warns her that conditions are unlivable and that she’s the only human alive. And then a woman (Hilary Swank) shows up at the door. The lies we tell our children and how they could either protect or harm them is the theme woven through “I Am Mother” as Daughter battles with who to believe – the being that raised her or the one she’s just encountered. Every child reaches a point when they realize that they have not been told the entire truth from their creator, whether it’s as simple as believing in Santa Claus or a political or philosophical rift between a parent and child. Clearly, “I Am Mother” is thematically rich. It’s just not dramatically rich. It’s far too long, and mistakes too many of its shallow ideas for remarkably deep ones. It has a few too many twists and, most disappointingly, completely discards its first opportunity to make a commentary on human nature by making Daughter a relatively average teenage girl. What would a girl be like who has never felt human touch, only seeing people through old recordings of “The Tonight Show”? She wouldn’t be as normal as Daughter. 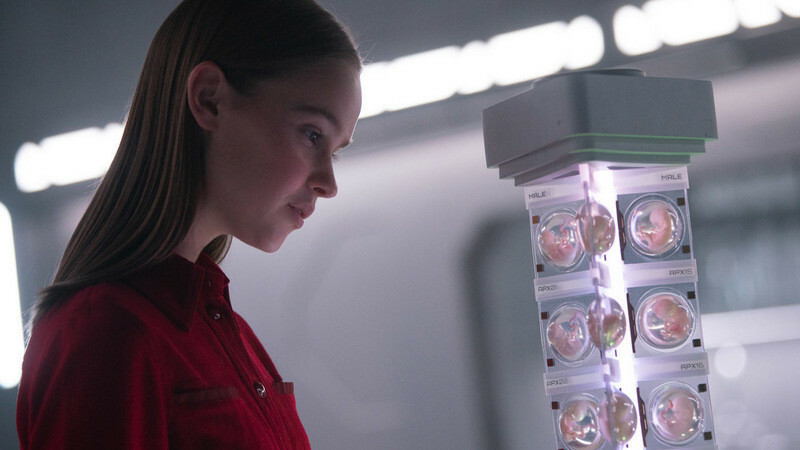 But “I Am Mother” has other intentions, ultimately feeling more like a “Terminator” rip-off when you want it to share more DNA with “Ex Machina.” It never gets in the heads of its three characters, using them as two-dimensional action movies pawns. Again, there are some interesting ideas here that could have been shaped into a tighter, more challenging movie, but that wasn’t meant to be “Mother”’s creation. No Perfect Circles: Producer David Ichioka on "The Box Trolls"